Imagine if you will, not owning a clothes washer nor clothes dryer, nor loading your dirty laundry into your car to drive to a laundromat, there to spend several off-smelling hours pushing dollar bills into machines. Imagine instead a service whereby you put all your dirty laundry into a basket, the basket picked up at your house, returned in two or three days washed, dried and folded. How 21st century! That door-to-door service, is exactly what was being offered by Harriman Bros. New Method Laundry Co. over one hundred years ago. And not just for Maynard. 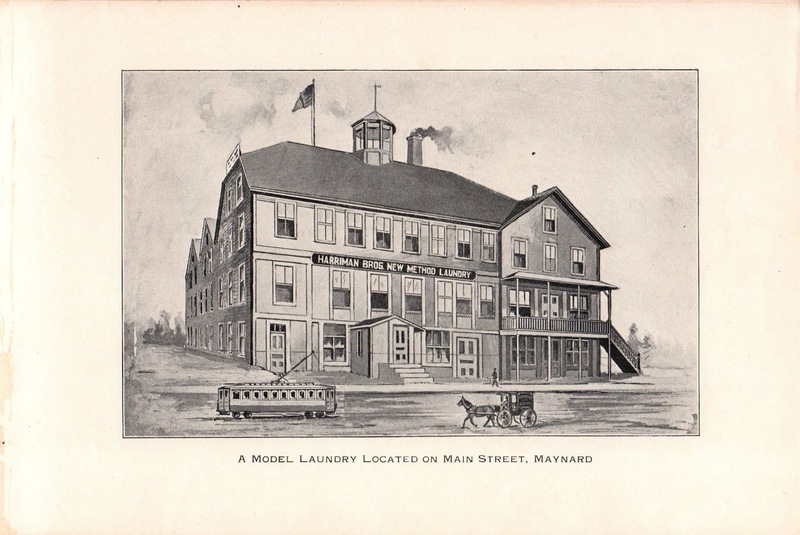 Harriman served towns as far as 30 miles away, first by horse-drawn wagon, and by 1905 using gasoline-powered trucks to transport laundry to and from Maynard. At its peak the laundry employed 75 women and men, and was the second-largest business in Maynard, after the mill. date unknown, but trolley service in Maynard began in 1901. Trolley, horse, carriage and pedestrian smaller than real life. John K. Harriman (1826-1906) was an early arrival to Assabet Village. He was postmaster from 1862 to 1866. He was one of the signers of the Fowler petition to create the Town of Maynard, also involved in building of the first high school, establishing street lamps (kerosene, not electric) and construction of the first jail. To the last: May 1871, John K. Harriman, Amory Maynard and John Fuller supervised building of a brick building, about fourteen feet by fourteen feet, containing two cells. The cost was $455.70. An 1875 map shows him owning property and buildings fronting to Main Street on both sides of Harriman Court. John and his wife Harriet (Phillips) Harriman had three sons: John, Frank and Rowland. It was the two younger brothers – Frank and Rowland – who decided to go into the laundry business. In September 1890 they rented two rooms in their father’s building on the east side of Harriman Court. This was not their first business venture. An 1887-88 directory for Maynard and Stow lists Frank and Rowland listed as owners/operators of Maynard Ice Cream Company, in their father’s building. Other occupants were their father’s grocery store, barber shop, photography studio, cigar store, two tenements and a hall. 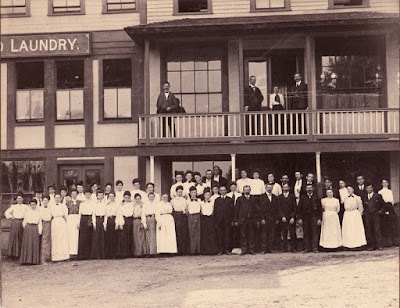 Over time their laundry business expanded until it completely occupied all 15,000 square feet of the three-story building. The building was capped by an eight-sided cupola, brightly shining out at night courtesy of powerful gas lights. Pay for a 45-hour week – shorter than the 55 hours being put in by mill workers – was $7.00 per week for women and $11.00 per week for men. The business served towns for miles around. Horse-drawn wagons would bring out clean laundry and return with dirty. In August of 1905. 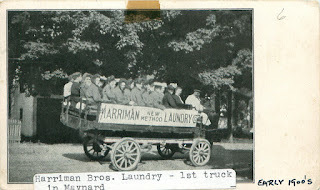 Harriman Brothers New Method Laundry purchased its first truck, and a second soon after. The trucks also served to convey employees on public outings. 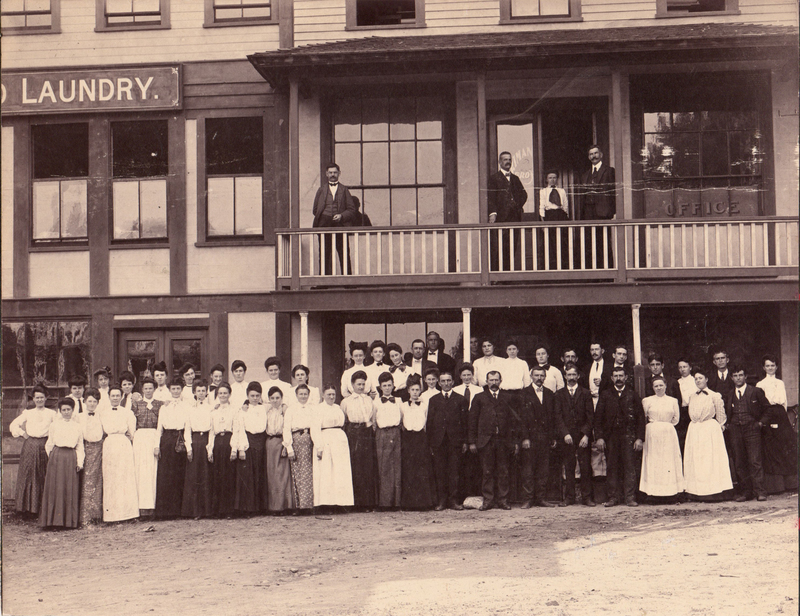 In May of 1909 the brothers sold the business to two gentlemen who moved it to Hudson. They obviously lacked some essential business savvy, because the business failed within the year. Roland, the younger of the brothers, was 45 years old at time of the sale, 75 years old when he died in 1939. He was buried in Glenwood Cemetery along with his wife and son. There is nothing in the town’s historical records to indicate if he owned or worked in any type of business after the sale. Even less is known about his older brother, not even date of birth, death, or where buried. (see below) Massachusetts house deed records indicate that he sold his father’s homestead, on the west side of Harriman Court, in 1910 to the Finnish Temperance Society. Decades later the building went to Veterans of Foreign Wars, VFW Post #1812, and then in 1992 to St. Stephen’s Knanaya Church, which owns it now. He appears to have purchased the Walcott House in Stow in 1910, but sold it in 1911 and disappeared from recorded history. And the meaning of “New Method?” An internet search on “new method laundry” yields many laundry businesses with that phrase in the name. A good guess is that it applied to ‘dry cleaning.’ Back then, dry cleaning used petroleum-extracted solvents in lieu of water, so fire was an ever-present risk. After this article ran in the paper, town historian Peg Brown located an obituary and other information for Rowland that mentioned he had moved to to Stow while still running the laundry with his brother, later to Florida (! ), then Newton, then later to Milton, where he died, survived by a son and a daughter. He was interred in Maynard's Glenwood Cemetery. Frank was born in 1859, died in 1936, married 1906, also moved to Stow while still operating the laundry, later moved to Florida (!) where he died, survived by his wife and daughter. 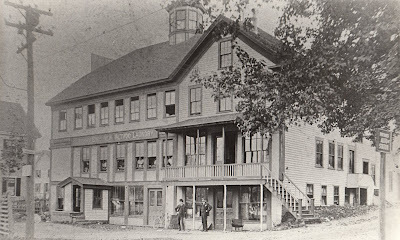 John A. Harriman, their older brother, appears to have worked at the laundry, and may be the third man on the balcony, although the Historical Society photo caption did not have a name. John and his second wife - Ella - are also in the Glenwood Cemetery. Frank and family are not.